The House Freedom Caucus on Friday launched a petition to force a vote on the House floor on a straight Obamacare repeal bill, meaning the fight over health care isn't dead — at least, not yet. The group of conservative Republicans needs 218 members to sign the discharge petition to bring H. Res. 458, a clean repeal of Obamacare, to the floor for a vote. The petition is a type of parliamentary procedure used to bypass the committee process. A handful of House Freedom Caucus members, including Rep. Jim Jordan (R-Ohio), Tom Garrett (R-Virginia), and Scott Perry (R-Pennsylvania) signed the petition from the House floor on Friday. 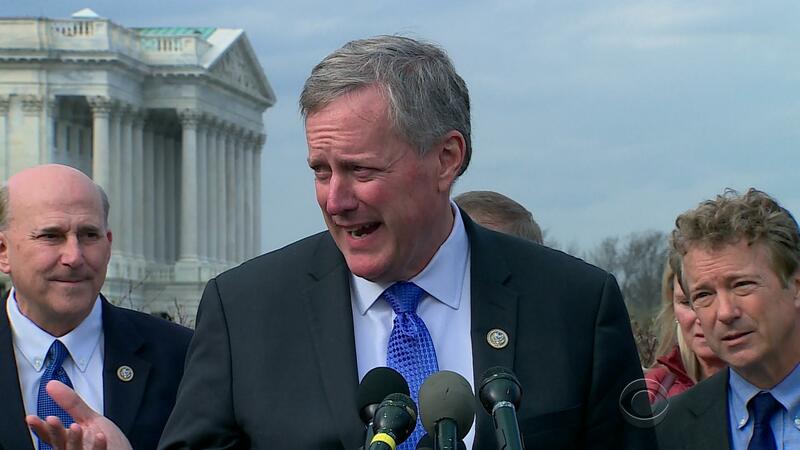 "It's critical that we keep our promise to the American people and repeal Obamacare and replace it with a policy that works for American families," said caucus chairman Rep. Mark Meadows (R-North Carolina), in a statement. "We cannot drag this process out any longer. This bill – with a two-year delay on implementation of repeal – will force Congress to come together on a replacement bill. President Trump is eager to sign repeal and replace, it's time we get to work and send both to his desk." The petition is an attempt to push forward the stalled health care reform in Congress. The House passed a bill to repeal and replace parts of Obamacare in May, but the Senate failed to do so twice, and Senate Majority Leader Mitch McConnell and other top Republicans made it clear the Senate is moving on to other issues like tax reform. Chances of a straight Obamacare repeal in the House or the Senate don't look good. The Senate rejected a clean Obamacare repeal bill last month. But Mr. Trump, who has publicly shamed McConnell for the health care failure on Twitter and won't answer whether he wants McConnell to step aside, isn't giving up on a key part of his campaign platform to repeal his predecessor's signature legislation. The House Freedom Caucus hopes to bring the clean repeal bill to a vote in September. "We make this job too difficult," Jordan said in a statement. "We need to do what we told the voters we were going to do. There's no reason we should send less on repeal to President Trump's desk than we sent to President Obama's. Now is the time for members of Congress to put on the record whether they're truly for repeal of Obamacare."